We evaluate the visual quality of a line using a curvature 'comb' plot (shown in green below). 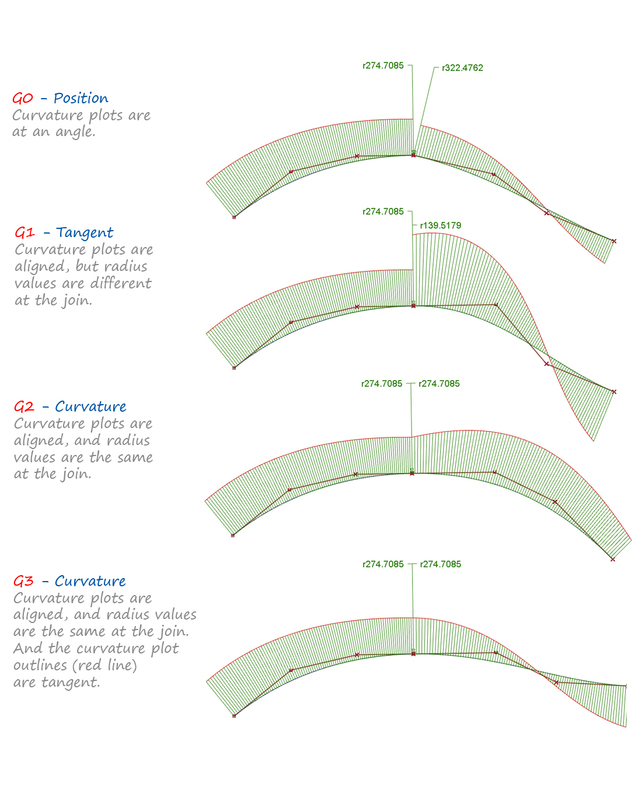 This can be applied to curves, surface edges and isoparms, and to section lines through a surface. The length of each curvature line is proportional to the inverse of the radius of the curve at that point. The direction of each curvature line is at 90 degrees (normal) to the curve at each point. The red outline shows the smoothness and character of the curve. The comb plot can give you valuable information on the look and 'feel' of your curve or surface, and with experience you will learn to interpret the comb plot and understand how it relates to the real-life surface. So far we've just looked at applying the comb plot to a single curve or isoparm. 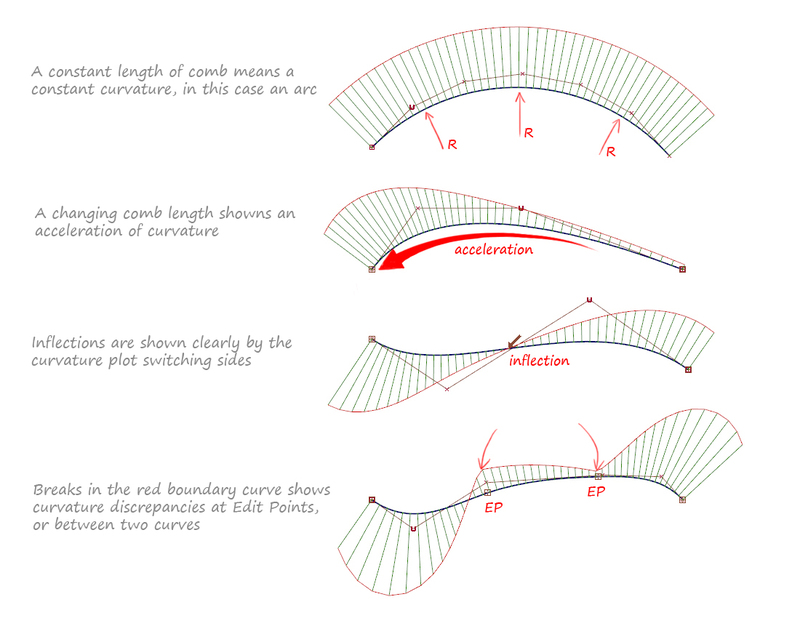 But comb plots are key to accurately understanding how two curves or surfaces join - their 'continuity'. The four continuity levels, G1, G1, G2 and G3 are explained in detail in the Continuity 1 : G0, G1, G2, G3 Theory Builder. 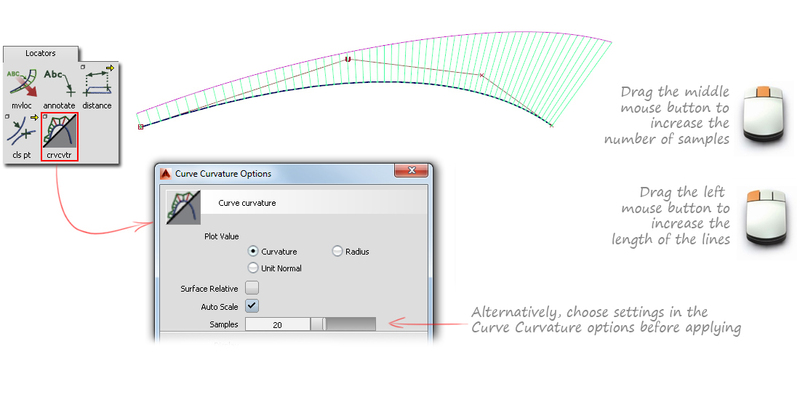 Apply the Curve Curvature tool by clicking on a curve or surface isoparm. At this time (while the locator is active) you can adjust the comb plot interactively using the mouse buttons. Use Pick → Locator if it's not already active. Use Windows → Information → Information Window to change the settings. Use Delete → Locators to remove. The xsedit icon on the Control Panel. This has the advantage that it is independent of the surface orientation and isoparm direction, so gives an accurate comparison across different surfaces. It's important to note that these comb plots are applied to the tessellated surface, and so the accuracy is controlled by the Diagnostic Shading tolerance setting. 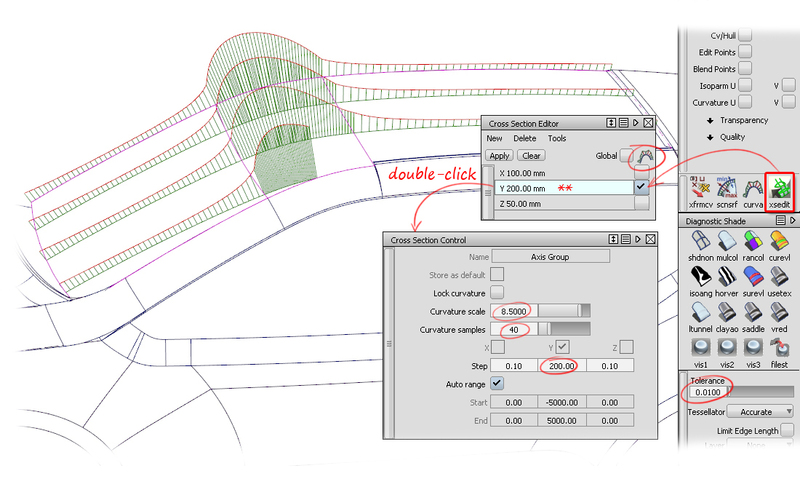 For more information on creating different types of cross-section, see the v2011 Update Movies - Cross-Section Editor. Control Panel → Display → Curvature U/V (Displays curvature on the edges and isoparms of a surface). Control Panel → Curvature Controls the display of the comb plot - (size and spacing).